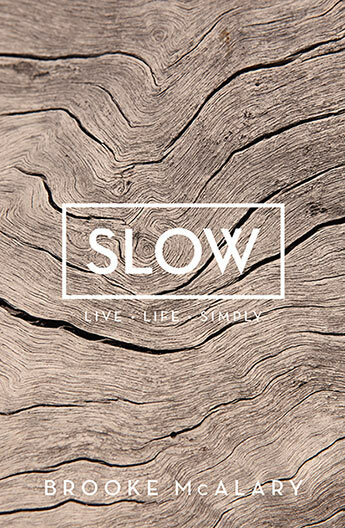 And so begins Slow, written by Aussie Brooke McAlary to help capture her transition from frazzled, despondent hamster-on-the-wheel to slower and more simple living. With a focus on spending less time on some things (work, scrolling social media, buying new stuff all the time) to have more time for things that matter most to her: family, reading, pottering around the garden, Brooke hits many nails on the head throughout the book! I really, really enjoyed reading Slow. Part memoir, part practical companion, there is nothing preachy about this book (which I have found in other similar-ish titles) but it gave me many ‘a-ha!’ moments along the way. Like the whole busy thing – we are all busy, right? But why can I find time to scroll mindlessly through social media feeds 185014 times a day, but not to call my sister in Tassie once a week? This is perhaps the biggest thing I have chosen to focus on right now; Brooke’s message about slow living is really about taking it one step at a time. Not only is this practical, but it makes it completely accessible. So I’ve become more aware of my habit, and I’ve learnt: it’s ok to check social media, but not at the expense of more important activities – like, say, keeping in touch with family or friends who live interstate or overseas; or playing with my little boy after he’s been at day care all day. There is so much more to Slow than this, but this is just one bite-sized nugget that has helped start me towards a slower living path. I highly recommend this little gem to anyone who is looking for some practical tips on how to actually move away from the fast lane and gently dip their toes into a slower living lifestyle.